Edmundas Jakilaitis, LRT TELEVIZIJOS laida „Dėmesio centre"
The annual report of the President Dalia Grybauskaitė is receiving both praise regarding its structure and specificity, while others note what was missing from the afore mentioned report – the primary focus on areas which fall directly under the responsibility of the President herself. Political scientists further note that the leader of the state has severely affected the current composition of the cabinet of ministers, should not dissociate herself from the political responsibility of the Government. The content of the report was reviewed during the talk show “Dėmesio centre“ with Paulimui Gritėnu, a reviewer for 15min.lt and political scientists Mažvydu Jastramskiu and Kęstučiu Girniumi. - In my opinion, the report of the President was a text that was “nailed” together very well. What is your opinion on it, mister Gritėnai? P. Gritėnas: I agree. Out of the grand total of eight statements which we have already heard, this one was the most structure and the most logically bound together. At first – pushing away from the February 16th, the celebration of the state’s century of restoration which is mentioned at the end, furthermore the fact that it required courage and determination for those signatories that helped to restore Lithuania. Throughout the text there were many part that followed each other side by side. It would appear that in the second paragraph it was stated that in the current situation of global challenges it is very important to ensure personal decisiveness and initiative. From that there was a jump made to reforms and how their being carried out, here bearing in mind that the “peasants” and “greens” forget the aspect of personal decisiveness. This is only one of the example of how the president logically went through the entirety of the state’s internal policy problems. Mister Jastramskis, I know that you have analysed the statement from a variety of different angles, how many key words did it contain. What does your analysis show us? M. Jastramskis: A quantitative perspective of it shows us quite a lot. The words such as “state”, “people”, “country”, “our states” and etc. are quite common in the report. By combining the lot of them by proxy we get the statement “we need our country”. Comparing this to last years (report) we see another thing- that the word for example “Europe” is referenced a significantly less amount of times. After reading the report, we can clearly see that “Europe” was significantly more important and given much more attention in last year’s report. Year after year political scientists emphasize the same thing – that the president pays far too little attention to the states foreign policy. Mister Girniau, what message did you hear? K. Girnius: The main message – is that the little romance between the “peasants” and the president, is over. Furthermore, courage is not enough, we also need brain power. Which is clearly lacking. Although, of course there are several areas that could be improved upon. What was promised, is not done. I even liked the accent made on the need to build and rebuild the traditional parties what was at first looked with much criticism. Another thing that was said that in the absence of strong political parties all kinds of populism will come. Which is also applied to the “peasants”. M. Jastramskis: The president cannot distance herself from the political responsibility of the current Governments. 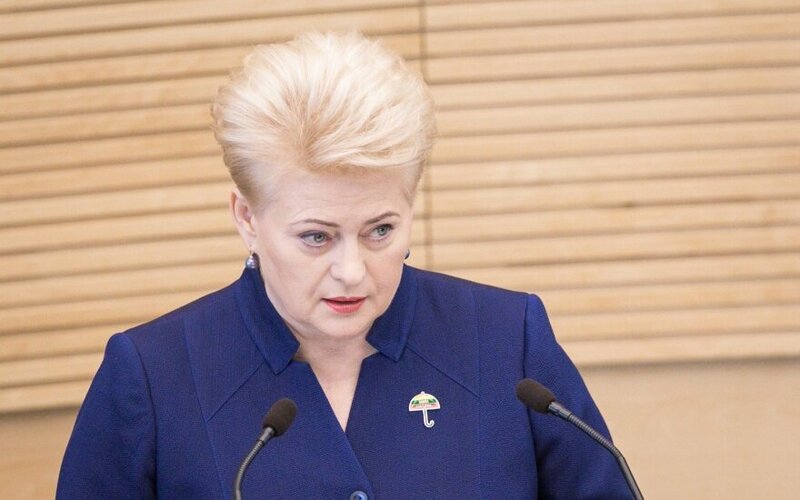 Looking retrospect when comparing this with the situation in 2012 when forming this cabinet of ministers Dalia Grybauskaitė had a significant influence. Her selection of one or more ministers were heavily dependent on her. Another, important factor is the focus on the strengthening of parties. I am very happy to see that the president is focused on the current state of the political system. In 1942 political scientists E. Schneider stated that modern politics is unthinkable without political parties, thus it’s commendable that this is also understood in 2017 at the highest political level. However, at the same time D. Grybauskaitė has contributed to the formation of the professional non-partisan technocratic political image in Lithuania formation, which made it possible for this government to come into place. I think, the president cannot fully distance herself from the situation we have today. K. Girnius: The “peasants” during the first round of the election were in place, as the majority of the votes were collected by the conservatives. They won the larger portion of their deputies during the second round, when people were voting against the social democrats and conservatives. I also do not think that the President is completely impartial and has distanced herself form the situation. But I think that as the chairman of the Parliament stated a few days ago, the Presidents trust is highly important. With this language there was a need to “pull up” expressed. Mister Gritėnai, another signal that there is a growing distance between the ruling coalition and the president significant, is that she is monitoring them from a distance and does not identified herself with them. It seems that after the report, the amount of critique will grow. What do you think? P. Gritėnas: Yes, this is also an important accent. I would not highlight the mentioned importance given to the parties. I think that the president borrows certain rhetoric’s form the EU, after meetings with other leaders. A particularly serious problem for the EU today is the challenges facing traditional political parties. For example France, E. Macron represented a party formed only a year ago, and defeated the radical M. Le Pen. This is understood as a common problem for all of Europe. In Lithuania, what the president referred to regarding parties, is the strengthening the parties in reference to their leaders not their political ideas. Which for me appeared to be a very weak “cure”, as first of all there is a need to strengthen the ideology. Regarding the criticism towards the ruling majority I would say that the president critiqued not the reforms themselves but how their being implemented. The observation regarding brains, was made in regards to how the reforms are made. For instance, let us say that the same was said in regards to alcohol, that during the implementation of the reform, we need to unite and not divide over it. That was the key focus, regarding how these reforms are being implemented, in a slow, non-transparent and unclear manner. K. Girnius: Everyone will agree that reforms are necessary. The point is that the “peasants” are doing this poorly. M. Jastramskis: Let us not forget the fact that the ruling majority is extremely fragile, managing to function only minimally. They technically have 73 mandates in the Parliament and in fact all of their reforms without getting support from the conservatives depend heavily on the social democrats which have a blocking power. I fully agree to the statement that they simply received too many mandates. The majority of the “peasants” received “bonuses” in single-mandate constituencies which the party received the most in Lithuania’s history. As a result of this there is a big gap between how many seat in Parliament they received and what was the actual support during the Parliamentary elections, thus the party should be careful in its dealings with the public, experts, other politicians and etc. I would not place too much of an emphasis on the alcohol reform as apart from the increasing excise on alcohol the public widely supports the reform proposed. K. Girnius: However, the main problem in Lithuania is emigration. During the elections the majority of the parties talked about the need to do something, the need to improve the quality of life, salaries and etc. The President mentioned migration only on the last page and then only with a very vague utterance that states the Estonians are doing well on the matter, but it is unclear why. But it is very clear that the wages there are 70 pct. higher than in Lithuania. Another idea was sounded, in regards that the reforms that are being implemented will not return the people. P. Gritėnas: Even the ideas which are supported by the public they are communicated in such a manner that for example the small scandal regarding the data of the World Health Organization. When different sets of data are being presented and etc. it allows the public to think that regardless of the fact if the Government wants what is good for the public, it is cheating them by adopting its decisions. When we’re talking about emigration. Everyone wants what is best for Lithuania, but do we trust the Government to achieve this? It would seem that the presidents comment regarding the fact that the parliamentarians are creating a negative image of Lithuania to the people watching abroad. There is little focus on foreign policy and not a word about Poland. Which appears to be a kind of a stigma plaguing the rhetoric for several years. How do you interpret this, mister Girnius? K. Girnius: Not only Poland, but also the Baltic States. Estonia was also mentioned in the migration context. Here, Russia, the EU and nothing else. We are not talking about the Scandinavian countries with which we have good relations. But Poland is like a black hole, as if from us to the West there is only Kaliningrad and nothing else. I am surprised in general, since this is the area of the President. It would be good, if she would not only comment on what the Government was doing and/or should be doing but would also set goals in the foreign policy, and a year later to go back and see how successful it was. But she is avoiding this. M. Jastramskis: Perhaps emigration is not Lithuania’s largest problem. The biggest problem is that the different branches of Government do not see this, what is right under their nose. The office of the president does not see this and does not want to do anything that would be important in regards to foreign policy. The Parliament does not see emigration and economic problems, which are important to the residence. Another thing that is obvious that there are no strong parties and we are looking at Europe for examples, although we have examples of this here. According to, the electoral variability we are among the last in Europe. It is time to focus on realities, real problems and that should be done not only by the ruling party but also other institutions, as well. P. Gritėnas: The Polish subject was determined by the fact that the president for several times in a row allocated the speech not regarding jobs but rather a generalization of events taking place in the state. If she tried to be critical of herself, that she should include the Polish topic, as currently she game more attention criticising the Government, the Parliament, highlighting the fact what is bad for the society, thus we did not receive anything about Poland.